Easter is the day we all wait for! With the winters gone and the onset of a warm and welcoming Spring, and the“ Ressurection of The Lord Jesus” - this day is auspicious and wonderful on all counts. Easter is celebrated on the first Sunday after Full Moon and Spring Equinox. This year, the day will fall on 21 April. Reveal about your love life by Free Love Tarot Reading! Despite it being a Christian festival, Easter is celebrated all over the world with much gusto and enthusiasm. It is the first holiday since Christmas break and a time when everyone gets together to enjoy the long weekend with families. This day also marks the end of Lent or a period of fasting which further adds to the celebrations. Easter marks its importance as the first celebration of revival which somehow affects the horoscope predictions as well in the new zodiac calendar after the spring equinox. It is the time to rejoice, revel and become spiritually more aware. 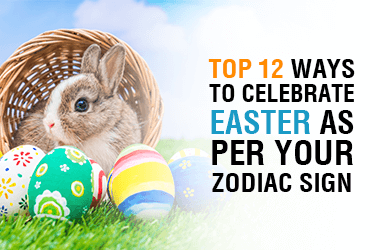 So when you are already thinking about the Easter celebration, why not try to celebrate it in a way based on your zodiac signs. This way, you will be able to make the most of this colorful festival and celebrate it in a unique way. Aries, it's your birth month. You can celebrate Easter in the way you would celebrate your birthday. You can decorate the Easter egg or organize and participate in the easter egg race where the one who rolls the egg farthest without breaking wins the game. This is the most exciting way that may perfectly suit your energy levels and enthusiastic spirits. Taurus, you work in the most organized way and might have already started preparation for this big day. You are a food-connoisseur and the best way for you to celebrate Easter is to cook the way you want. Delight yourself with dandelion salad served with boiled eggs and diced bacon. Let the best desserts satisfy your foody soul. Invite people over and indulge in the best delicacies. Gemini you are fun-loving and good at playing tricks. Then, why not enjoy the Easter week playing your favorite games with family and friends. There is nothing more joyful than a good get-together at home. Also, being an airy sign you love to travel. So, a vacation with your family on this long weekend might also be a nice idea. You are emotional and loving. There is nothing better for you to spend time with your family. Being a person of traditional values, you would like to spend time cherishing your childhood memories of coloring eggs and preparing festivities like good old times. Leo, you like the royal way to celebrate your good days and this Easter will not be different. You may invite your friends and throw a garden party for your guests to enjoy the beautiful sunny weather along with a lavish sumptuous dinner. With the heart of a believer, you may go for the midnight mass and the paschal meal at church. Virgo, you tend to pay attention to even the minutest detail and want everything to be unique and perfect. Decorating Easter eggs in different styles, using the natural dyes and old calligraphy could be some of the things you would like to do on this day. Prepare a feast table from organic veggies of your garden. You may also make bunnies or bells from origami to add a fun element in your budget-friendly plan. Your artistic skills show your keen interest in preparing and decorating for the festival. You love #socializing and this day is a good opportunity for you to call your friends and visit your distant relatives. Paint Easter eggs with the creative quotes and gift it to your loved ones. You may also show your creativity by hanging them on the Easter tree. Your excited soul might have already begun to plan your Easter a week before. On this day, you look for giving peace to your spiritually intense mind by getting involved in religious activity or meditation. You may like going into church mass and celebrate Easter by remembering the resurrection of the Lord. Your humorous and witty side may add more fun to your Easter event. So, indulge yourself in family fun events or paint Easter eggs with funny patterns. You like to keep things simple and convenient, so you might go for a simple but beautiful decoration at your home. A family gathering may excite you but try to bring an element of some surprise to add liveliness to the Easter party for your loved ones. Your love for tradition may want you to add some meaning and substance to your Easter #celebration. You might attend the masses and family prayers religiously. You may plan a small Easter celebration with just your close family around. Paschal feasts may fill you with spiritual contentment. You love experiments and might bring some new experiments at the dinner table. Your gastronomical nature may surely bring an element of surprise to the flavors of food and drinks. Cooking Lamb’s lettuce, baking chocolate cakes or painting easter eggs, you will try all. Your celebrations will surely involve some quirk and fun. Pisces, you are selfless and compassionate. You love the family fun games and enjoy the feast cooked with loved ones. Go for pleasant home decoration with nice easter bells. Fill your surroundings with the harmony of music and good lighting. You might also plan to send creative cards to your close ones as a sweet gesture of love. Easter week is the week of revival and happiness. It is the perfect time to bring vigor and spirituality in life. So, plan each day according to your daily horoscope prediction and keep your wishes in your Easter prayers. You may definitely see your Easter showered with sweetness, blessings, and laughter the way you desire. Happy Easter!